When you compare this photo with the two previous photos in the earlier posts shown below you can see that I have covered most of the white paper. 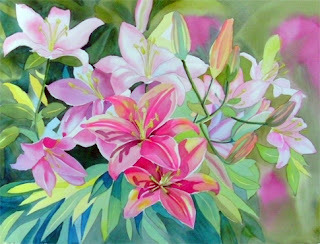 The painting is coming together, I can see the mass of lily flowers, the leaves and the background. I have more detail on the left side of the background verses the right where I have suggested flowers and leaves. I did that out of focus look on the right background area by painting that area wet into wet. I will continue adding more detail but still stepping back and seeing the painting as a whole. Right now I can see my focal point clearly and that is the two flowers in the bottom center of the painting. They stand out from the others because they are bolder in color and have more detail. Remember I still have the masking fluid on the detailed centers of each flower. I will not remove that until I am almost finished with the watercolor painting.